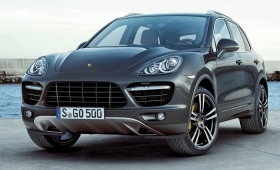 The Cayenne is Porsche's best-selling model in China, followed by the Panamera. Porsche AG sold 14,785 vehicles in China last year, up 63 percent from 2009, as sales of the Cayenne SUV remained strong, the company said in a statement. The carmaker sold 8,612 Cayennes in China, Hong Kong and Macau last year. The Panamera was Porsche's second most popular model in China, with sales of 3,833 units. Deliveries of the Porsche 911 model, together with the Boxster and Cayman, rose 77 percent to 2,340 units. In an e-mailed statement, Bernhard Maier, Porsche's board member for sales and marketing, said the company will triple the size of its dealer network in the next few years. Currently, Porsche has 35 dealerships in China. Porsche CEO Matthias Mueller has said he wants to expand that group to 100 dealerships. By 2013, Porsche aims to sell 15,000 units annually in China. To hit that target, the company is considering a proposal to build the Cajun crossover -- which is still under development -- in the same Chinese assembly plant as its sister vehicle, the Audi Q5. The four-door Cajun is scheduled to enter production in 2013.